Don’t worry about finding the cash for a Kell Brook v Amir Khan ringside ticket - it isn’t going to happen. 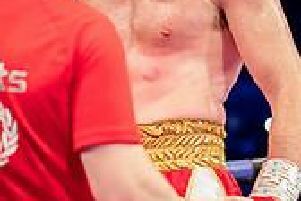 That’s the view of Brook’s trainer, Dom Ingle, who is scornful of the Bolton fighter’s stated desire to take on the Sheffield world champion. “Khan doesn’t want to fight Kell” said Ingle. “He is like a kid going past a neighbour’s house and rattling a stick at the fence knowing the dog can’t get out. On TV, Khan says that he schooled Kell as an amateur and he’d do it again but the truth is that he has no intention of fighting him. “When (promoter) Eddie Hearn offered to make it happen he demanded 70-30 of the money knowing that he was talking his way out of it. Suggesting that deal was his way of edging himself out of the equation. He knew it was never going to happen. Ingle believes the big broadcasters should pressure Khan. “The only way that it is going to happen is if the TV networks try and force him to fight a decent name. “He is in line to fight the winner of Danny Garcia v Keith Thurman but Garcia stopped him (fourth round, 2012) so who would want to see that again? Brook is frustrated by the wrangling - and is undecided which weight he will next campaign at. He said: “Everybody wants this fight so badly and I desperately want to give them this fight. We’ve come to a dead end at the minute. “I’m going to get back in the gym now, I’m going to start dieting. I’m going to be listening to my body and see if I can get down to a certain weight, so many weeks before the fight when we’re making welterweight” he told Sky Sports. “I’m just going to see if we move to 154, or if we fight Errol Spence. Hearn added: “I have to say that 147-pounds for Kell Brook is not a good move. He’s struggled to make that weight for a long time. He made 160 [for Golovkin] and made it very well but it was a little too much weight. “But why deplete yourself when you can be such a better fighter at 154-pounds,” Hearn said.